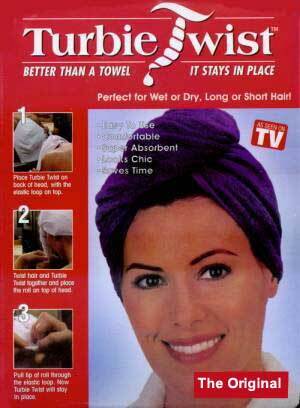 The Hair Towel that's specially designed for wrapping wet or dry hair. Simply slip over hair...then twist, loop and it's there to stay! Turbie Twist's tapered design fits on any head, is Microfiber and lightweight. This Hair Towel is attractive, functional and so comfortable! One size fits all. Turbie Twist is the lightweight towel replacement, that is so much better than a towel. Don't get frustrated trying to dry your hair. Not only is the Turbie Twist over 5 times as absorbent as a towel, it is guaranteed to stay in place. 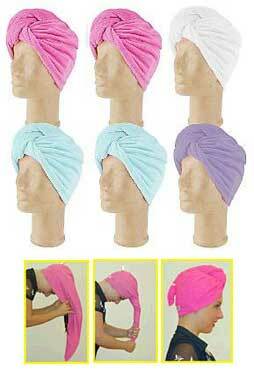 Save time, and dry your hair the Turbie Twist way! The extraordinary new hair towel that you slip over wet / dry hair ... then twist, loop and it's there to stay! Turbie Twist's tapered design allows a perfect fit on your head. It's made of 100% Microfiberet it's lightweight, not bulky like a bath towel. The unique non-slip twist and loop system stays in place. The Turbie Twist is attractive, functional, and so comfortable that using bath towels to wrap your hair becomes obsolete.